(ABOVE) The Augustinian Sisters of Our Lady of Consolation and (BELOW) Mrs. Rachel Ribo Dumuk with husband Red Dumuk receiving their SAVEcation prizes from RCBC. Travel is the new trend of the century. The last couple of years have made it clear that people and particularly the youth want nothing more than to make memories and see the world. Instead of spending a fortune on a backpacking trip through Europe or Central America, why not make some #2018TravelGoals here in Asia instead? Scuba-dive in Bohol. Aside from its famed Chocolate Hills, Bohol is actually home to the Danajon Bank: a 90-mile reef system located in the northern part of the province. Danajon Bank is actually one of only six documented double-barrier reefs in the whole world, making it a must-see for local and foreign scuba divers everywhere. The reef is also home to the country’s only Underwater Grotto. Selfie at Mahayaw Arch, Batanes. As perhaps the only place in the Philippines that experiences the four seasons, Batanes is a tourist favorite here in the country. From its lighthouses to the rolling hills that would give Julie Andrews’ Sound of Music a run for its money, there is no end to the picturesque attractions one can visit in Batanes. One such attraction is the Mahayaw Arch in Sabtang. A naturally made stone-arch carved over centuries by geologic forces as well as the sea, the arch is an iconic destination where tourists enjoy a shaded picnic after a day of sun at the beach. Ski in Sapporo, Japan. When people think Japan, they think treks to the summit of Mt. Fuji or endless shopping trips around Tokyo, one of the last things that come to mind is skiing. Who needs the Swiss Alps or those Ski Resorts in Aspen when you can just take a quick flight to Sapporo, Japan, where ski resorts are no more than 20 or 60 minutes away by car? One such place is the Okurayama Ski-Jump Stadium, a famous venue for adrenaline junkies where one can find a 120-meters K-spot jump. Watch a show at Dubai Opera. Dubai is quickly becoming a cultural hot-spot of the Middle East. Aside from housing the world’s tallest building, Dubai now has one of the most sought-after Opera Houses in the world. The Dubai Opera House is a world-class facility that floats prettily above the lake next to the Dubai Mall. The venue has hosted a slew of world-renowned talent including the best shows of Broadway and the West End as well as famous talents such as Placido Domingo. Brave the Minxiong Ghost House. Taiwan is home to many wonderful tourist spots, one of them is the hauntingly beautiful Minxiong Ghost House, a must-see for brave travelers unafraid of the paranormal. Located in the Chiayi countryside, the mansion has been abandoned since the 1950s for reasons unknown to most of the locals, still it has amassed enough myths about the property to make most of the people in the surrounding areas afraid to go near it. Asia is home to hundreds of other locations just waiting to be explored and published on a lucky traveler’s Instagram feed. 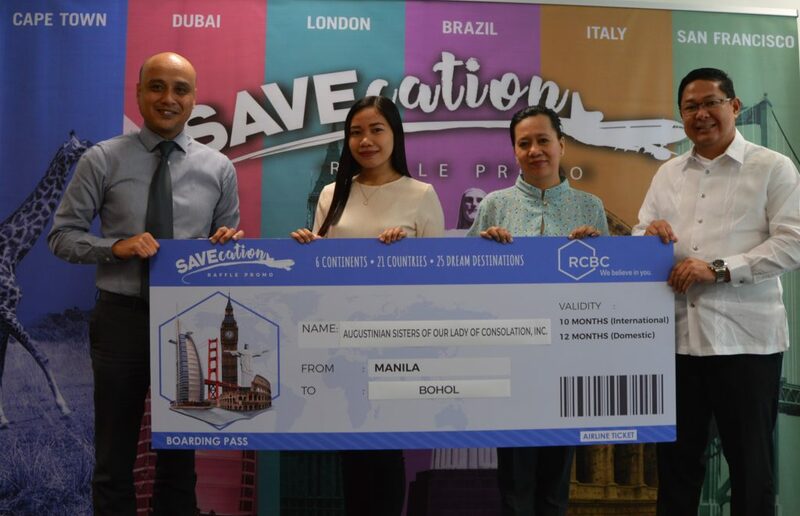 RCBC’s SAVEcation raffle promo gifts lucky depositors the chance to start their own travel goals when they maintain an additional average daily balance (“ADB”) of at least Php10,000 for Personal Savings or Checking Accounts and Php50,000 for Corporate Accounts. This earns them raffle entries to get the chance to win free trips to travel destinations across Asia, as well as in Europe, North America, South America, Oceania, and Africa. Just recently the first batch of lucky winners were drawn and awarded. James Kang Donadilla is the lucky winner of a trip to Ilocos. The Augustinian Sisters of Our Lady of Consolation, Inc. have won a trip to Bohol. 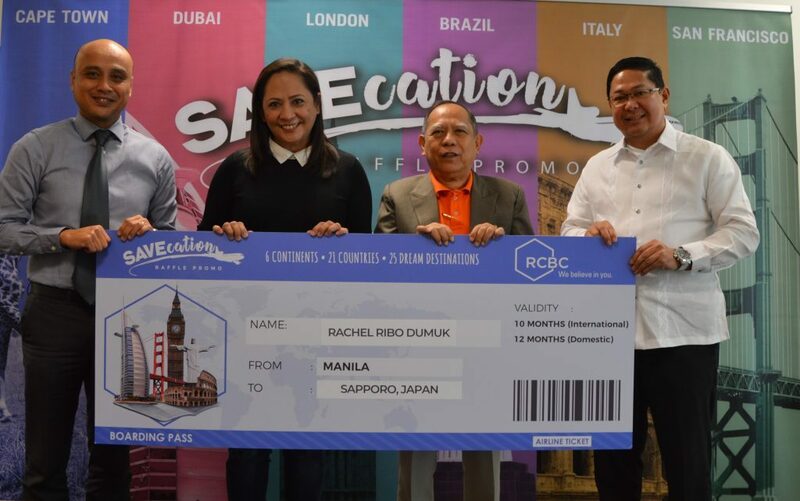 Finally, for the grand prize of the first batch, Rachel Ribo Dumuk became the lucky winner of once-in-a-lifetime trip to Sapporo, Japan. Qualified accountholders both new and existing still have a chance at their own #TravelGoals by regularly depositing fresh funds in their RCBC account. 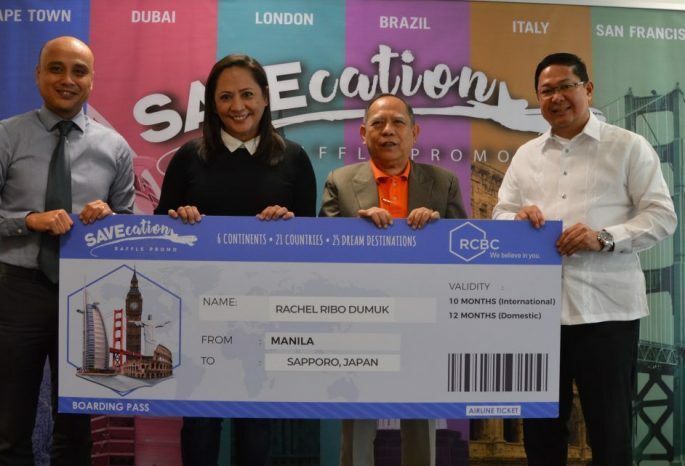 On February 2, 2018, trips to Batanes, Palawan, and Dubai will be raffled off. And finally, on April 3, 2018, the bank will hold its grand raffle draw for the remaining 19 destinations to Cape Town, Morocco, Italy, Greece, Belgium, Spain, London, San Francisco, Quebec, Alaska, Brazil, New Zealand, Maldives, Cambodia, Bali, Malaysia, Taiwan, South Korea, and Osaka, Japan! With the new year comes new possibilities and with RCBC’s SAVEcation raffle promo it’s never too late to start your very own #TravelGoals.